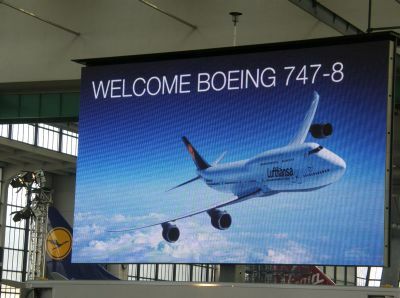 Last week Lufthansa, and Boeing, introduced to the media the all new 747-8 Intercontinental, the fourth incarnation of what is arguably the world’s greatest airliner. In fact some would argue it is at least the tenth version of Boeing’s mighty Jumbo. There was the 100 series, 200 – now called the Classic, 300, SP, SR and Dreamlifter, plus several cargo variants and of course the Shuttle Carrier. Who would have foreseen in April 1966, when Pan Am announced an order for 25, that until at least 2015 the Boeing 747 would remain in production, extending to a minimum of 1,524 units. It could be for a lot longer too. A great deal depends on the public reaction to the Dash Eight, and of course how it works out commercially. The aircraft boasts significantly improved aerodynamics and newly developed wingtips, and also provides tangible improvements in terms of eco-efficiency over the very successful 694 built 400 series. The Gent GEnx-2B engines use less fuel and achieve a substantial 15% reduction in fuel consumption and CO2 emissions per passenger. In addition, noise emissions have been reduced by 30%. Less than 30% of the original aircraft remains. The new Lufthansa aircraft can carry up to 362 passengers in comfort unthought-of of in the 1960s. By way of comparison the airline’s A380s offer 100 more seats, but it is very much the previous generation of accommodation. The Dash Eight is the world’s longest airliner, a one metre stretch on the Airbus A340-600. For the first time, Lufthansa First Class passengers will be seated in the front section of the main deck, favoured by most carriers. On the B747-8, this area is quiet – thanks to the outer skin insulation, sound-absorbing curtains, which minimise specific noises, and the sound-deadening material used in the aircraft flooring. Each of the eight First Class seats can be converted into a lie-flat bed, which is 2.07 metres long and 80cms wide, enabling passengers to enjoy a deep, relaxing sleep. 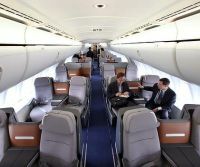 However it is the 92-seat Business Class which is the economic backbone of the aircraft. The upper deck, often referred to as “The Bubble”, has always been popular with airlines, with large window boxes, and exceptionally quiet. For the Dash Eight Lufthansa has fitted 32 seats. With a single aisle and 2+2 it is less daunting than the same carrier’s upper deck J class A380. Where Lufthansa has been very clever is to split the main Business Class cabin into two with the galley in-between. This gives a far more exclusive feeling. 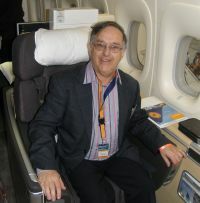 When the 747-8 enters scheduled service on 1 June 2012, Lufthansa passengers will have their first opportunity to experience the cabin (which will be retrofitted onto the A380s). The new seat offers exceptional comfort in a sitting or recumbent position, intuitive adjustment features, additional storage space and an individual entertainment system with much larger, 15-inch screens. At the press of a button, it converts into a comfortable bed with a horizontal sleeping surface measuring 1.98 metres in length. The aircraft also features an entirely new seating arrangement in the form of a “V”. Two neighbouring seats are angled towards one another along a central axis. This virtually doubles the distance at shoulder level between the seats, giving Business Class passengers even more privacy. Intriguing is the TV system. The screen not only swings out to suit any position the passenger requires, but slides and can be tilted too. A very, very flexible way of organising viewing. There are 30 radio channels and over 100 video options which are available in up to eight languages. Lufthansa has spared no effort in getting the interior right, throughout. For 362 Economy Class passengers the seating is exceptional with an articulating pan that moves forward automatically when the backrest is reclined, resulting in a much more comfortable and ergonomic posture. The gain is 5-7cms over the Boeing 747-400. The 9-inch TV screen is tilt mounted in the rear of the seat and offers some 50 video options, radio and games. PC power is provided for travellers to plug in their own iPads and portable devices. There are small but important improvements that will not be noticed by most passengers. 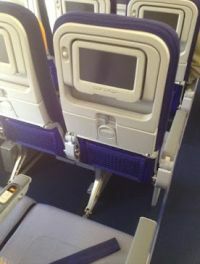 The literature pocket has been positioned higher up, behind the one piece tray table in order to provide additional legroom. Once again Lufthansa seems to have got the cabin size right in the way it has been divided up into sections. There is more headroom thanks to a slight change in the curvature of the roof, and the overhead bins have been increased in size. The airline will take delivery of 20 Boeing 747-8s up until 2015. The first five aircraft are due to be delivered to Lufthansa this year. They will be deployed on routes from Frankfurt to Washington DC, New Delhi, Bangalore, Chicago and Los Angeles.